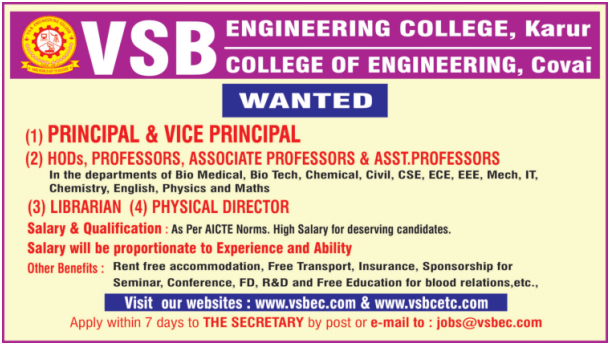 VSB Engineering College, Karur give Advertisement Officially for Faculty recruitment 2019- Post of Principal Jobs, Professor Jobs, Associate Professors Jobs, Assistant Professor Jobs for Engineering Departments. For More detail read full Jobs below. College Profile: VSB College was established by V.S.B. Educational Trust in the year 2002. It is an ISO 9001:2008 Certified, self-financing co-educational institution with an objective to afford value-based technical education and mould the students for industry requirements. Rent free accommodation, Free Transport, Insurance, Sponsorship for Seminar, Conference, FD, R&amp;D and Free Education for blood relations. How to Apply: Interested and Eligible candidates may send their resume along with recent passport size photograph and necessary documents to THE SECRETARY by Post or Email address with in 10 days.